Preface: Why this book came into being and why it will help you avoid common mistakes and stress while your dream is turning into a home. Chapter 1: Choosing your land – in which you’ll learn how to avoid some common mistakes and choose a parcel that suits your dream home. Chapter 2: Choosing a house plan – Questions to ask yourself ahead of time so you end up with a home that has all the features you want and none that you don’t. Chapter 3: The Permit Process – Learn how to get through it with all the hair still on your head. Chapter 4: Choices only you can make (if you want to love your house) – Here’s where you and your housemates need to come to agreement on the details before you can get started. Don’t wait to hash it out until the contractor has to have answers! Chapter 5: Before you get final bids – The serious talk you must have with your contractor (or subcontractors) before you ask for final bids – and what you must see in the bid before you accept it. Chapter 6: Should you be your own contractor? – Lets you in on just what a general contractor does, so you can decide if you want to tackle the job. Chapter 7: Organization and procedures – Here’s the order in which the parts and pieces turn into a house. You’ll learn why it’s taking so darn long! Chapter 8: Regarding loans and building inspections. – What to expect from the lender, appraiser, and government officials. 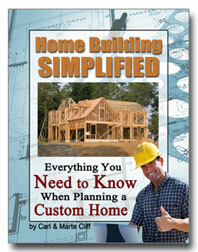 Chapter 9: Miscellaneous safeguards – Warnings and tips for smooth sailing through your home building project. The information you need – at a price you can’t afford to pass up.